Text: Stick ink, gouache & oil pastel on Arches Text Wove Paper. Interleaves: Sazanami Lace Paper from Japan. Cover: Lace Mogul Empire Paper from Victoria Paper. Hemp leaf binding with gold-tone beads. The lettering is hazily shown through a veil of lace paper. 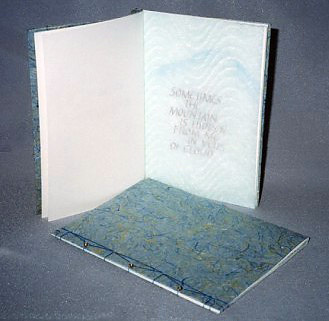 Book 6" x 4-3/8" (15.2cm x 11.1cm).